Warwickshire have signed England all-rounder Jenny Gunn from Nottinghamshire for the 2016 domestic season. Gunn joins up with fellow England players Becky Grundy and Amy Jones, to play in the One-Day Cup and for the Birmingham Bears in T20 matches. The 29-year-old will turn out for Yorkshire Diamonds when the new Women's Super League starts on 30 July. "Warwickshire have made good progress in the women's game. They have a base of young, talented players," said Gunn. 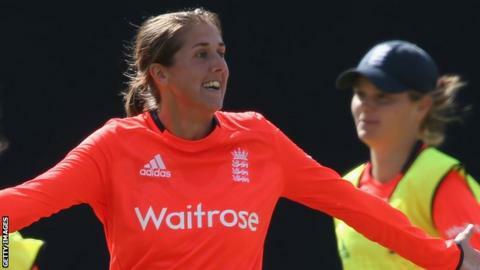 England players are required to play division one cricket and, in the wake of Notts' relegation last summer, Gunn follows the lead of Danni Wyatt, who also left Trent Bridge to sign for Sussex. The pair will meet at the Bears' new second home at Portland Road on 1 May when Warwickshire start their Women's One-Day Cup campaign at home to Sussex. Gunn's signing follows the arrival last week at Edgbaston of Australian all-rounder Anna Lanning. Gunn is the daughter of former Nottingham Forest footballer Bryn Gunn. "Jenny has been one of the leading cricketers in the women's game for several years," said Darren Franklin, Warwickshire's head of women's cricket. Since making her England debut against New Zealand in 2004, she has gone on to play 129 one-day internationals, making 1,460 runs and taking 120 wickets, 92 T20s and has won 11 Test caps. She was also part of the England teams that won the Women's Cricket World Cup and World T20 in 2009 and has played in five Ashes series wins.